New York : Quercus, 2014. This guide is for women cyclists who need practical, no-nonsense advice and information on cycling, but don't want to dispense with style in the process. Whether you're a committed bike commuter or a complete novice, blogger, entrepreneur and passionate cyclist Caz Nicklin gives the low-down on making cycling part of your lifestyle. From choosing the right bike for your needs to looking stylish and comfortable whatever the weather, and from combating dreaded "helmet hair" to road safety and fast repairs, this book tells you everything you need to know about life on two wheels. While visiting my sister this past weekend, we spent 90 minutes waiting for a table for a late lunch (that we never got – long story). The restaurant is part of a giant building that also has a coffee shop, an Anthropologie-esque objects area (perfumes and such), as well as a funky book store, where I found this gem. I’ve been contemplating buying a bicycle and, despite the name (ugh, “girls”), was interested enough in the content and the visual presentation to pick it up. I’m quite happy I did. The book is by a bicycle blogger and business owner who lives in London. While the publisher did translate the spellings to American English, some of the suggested measurements were clearly straight converted from metric – unless the author casually says things like “pick a point 62-98 feet in the distance.” Doubtful. But other than that, the advice is sound. From detailed descriptions of different types of bikes to fit your expected use (as opposed to just walking in and saying “I want to ride … a bike,” which was kind of my plan), to the different types of accessories you might need to be safe, the Ms. Nicklin lays out great suggestions. 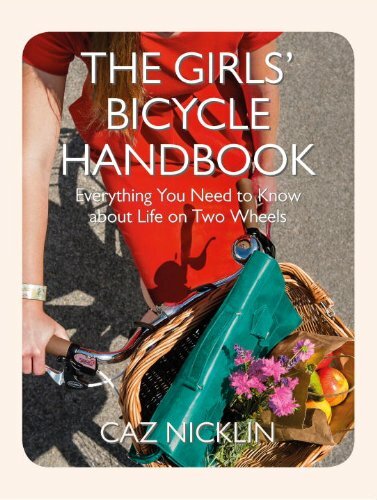 The book is peppered with profiles of other female bicyclists who either do interesting things (like cycle around the world) or have their own cycle businesses that specialize in items for female cyclists. Yes, the gendered idea struck me as a bit odd at first, and many of her suggestions are relevant to men, but she does take on things like dresses and fabrics to ride in, or how to avoid helmet hair after the commute to work. But it isn’t just about looking cute on a cycle; it’s about the steps to take to feel free and safe enough to really use this mode of transportation. There’s a chapter on bike security, safe riding and rules of the road, and a really detailed section on cycle maintenance. The author wants women to understand the cycles, and know how to make needed repairs and such on our own when possible. It’s pretty cool.